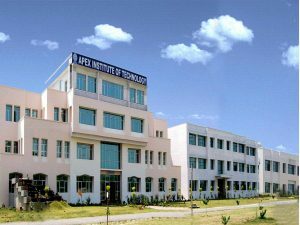 The Apex institute of Technology was established in the year 2007 under the aegis of Rudra Bilas Educational Welfare Society. The members of the society are distinguished educationists,prominent professionals, philanthropists and dedicated social workers. The campus of the institute has been built on an area of 20 acres of land. Placements: The T & P activities have been started well in advance with the target of 100% placement through campus interviews itself. A senior officer with long industrial experience has been made the incharge of the cell. Regular industrial visits of the students are being conducted. Training to the prefinal year students for appearing in written tests, Group Discussions & interviews is being imparted. The cell is also responsible for arranging the summer industrial training of the students. Campus: The Apex institute of Technology was established in the year 2007 under the aegis of Rudra Bilas Educational Welfare Society. The members of the society are distinguished educationists,prominent professionals, philanthropists and dedicated social workers. The campus of the institute has been built on an area of 20 acres of land. The campus is located at an ecofriendly locale, called Kaushalganj, about 6 km. from Rudrapur, on Delhi-Nainital National Highway No. 87. Aesthetically designed buildings, green lawns and backdrop of poplar trees provide a peaceful ambience to the campus. It is about 220 km from Delhi, 345 km from Lucknow, 75 km from Bareilly , 40 km from Rampur, 65 km from Moradabad , 75 km from Nainital & 240 km, from Dehradun. The nearest railway station is Rudrapur City (6 km), on Delhi-Kathgodam section of Northern Eastern Railways. Pantnagar, the nearest civil airport, is about 20 km from the institute. Central library: Presently, the library of the institute has a collection of over 15,000 books related to the courses and general field. It also subscribes many leading national & international journals. The Library is fully computerized through SIM software. Besides, a unique “Book Bank” service also operates in the library through which the students can borrow the text books for a complete semester. Hostel: Well furnished Hostel are available separately for boys and girls with a modern well equipped mess. Boy’s hostel is located in the campus itself whereas Girl’s hostel is in a fully secured residential area about 3 km from campus. To & Fro bus arrangements. have been made to commute from the Girl’s hostel to institute.